The Universal Carrier, also known as the Bren Gun Carrier is a common name describing a family of light armoured tracked vehicles built by Vickers-Armstrong. Produced between 1934 and 1960, the vehicle was used widely by Allied forces during the Second World War. Universal Carriers were usually used for transporting personnel and equipment, mostly support weapons, or as machine gun platforms. 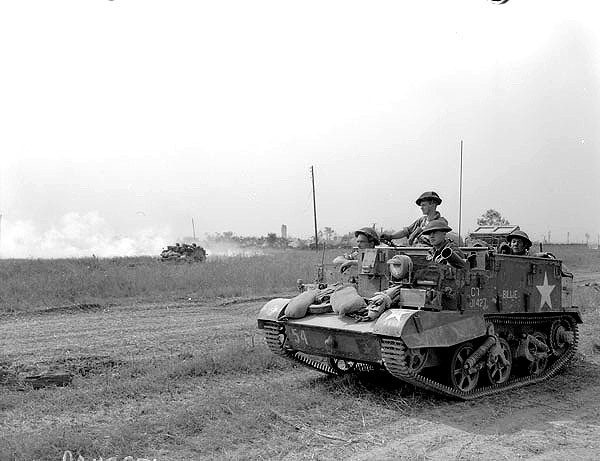 With some 113,000 built in the United Kingdom and abroad, it was the most numerous armoured fighting vehicle in history. As with some of my other metal models I can't remember the manufacturer of these. They come with separate tracks. I have a feeling, based on internet research, that they are SDD miniatures. I gave the carriers a white undercoat.